First appearing as a launch title for Xbox in 2001, the Halo series continues to be one of Microsoft’s strongest gaming franchises. Bolstered by the founding of the Halo World Championship in 2014, the Halo series has been a staple in competitive gaming since the very beginning. Its fresh take on level design and combat technology has made it a favorite in the eyes of millions of gamers, including pro gamers such as Brett “Naded” Leonard, Tyler “Ninja” Blevins, and Tyler “Spartan” Ganza. 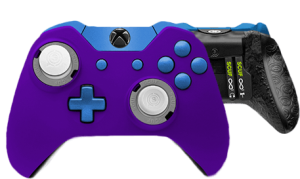 When under fire in Blood Gulch or Lockout, every split second counts and SCUF's patented paddles are exactly what a player needs to make the most out of every moment. - Map the left D-Pad button to your outer-left paddle. This means you can cycle through your grenades without sacrificing movement. - Map X to your inner-left paddle to focus your Sprint and movement to the same hand. - Map B to your inner-right paddle. Never lift your thumb from the thumbstick in order to aim and strike with melee or a Spartan Charge. - Map A to your outer-right paddle. This will allow you to jump and aim with the same hand at the same time. 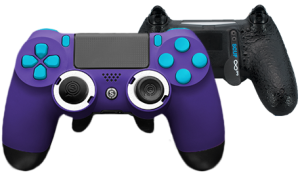 The SCUF interchangeable thumbstick system means a perfect fit for any hand size. - For the left thumbstick, go with a regular-sized concave: this allows you to dig in for movement, and makes it that much easier to click for a ground pound. - For the right thumbstick, a long-sized dome is the best way to go. The shape allows you to roll your thumb smoothly to aim, and the length of the stick assures quicker precision. Subscribe to the official Scuf Gaming newsletter now and stay informed of all the news around our innovations, eSports, upcoming promotions and deals.